Tablets. Tablets can be formed that are hard, but dissolve quickly. Microcrystalline cellulose is the same as cellulose, except that it meets USP standards. Microcrystalline cellulose is a term for refined wood pulp and is used as a texturizer, an anti-caking agent, a fat substitute, an emulsifier, an extender, and abulking agent in food production. It is a white, free-flowing powder. Chemically, it is an inert substance, is not degraded during digestion and has no appreciable absorption. In large quantities it provides dietary bulk and may lead to a laxative effect. In many ways[which? ], cellulose makes the ideal excipient. 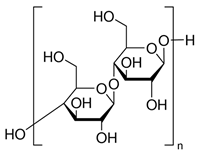 A naturally occurring polymer, it is composed of glucose units connected by a 1-4 beta glycosidic bond. These linear cellulose chains are bundled together as microfibril spiralled together in the walls of plant cell. Each microfibril exhibits a high degree of three-dimensional internal bonding resulting in a crystalline structure that is insoluble in water and resistant to reagents. There are, however, relatively weak segments of the microfibril with weaker internal bonding. These are called amorphous regions; some argue that they are more accurately called dislocations, because of the single-phase structure of microfibrils. The crystalline region is isolated to produce microcrystalline cellulose. Microcrystalline cellulose (MCC) is pure partially depolymerized cellulose synthesized from a-cellulose precursor. The MCC can be synthesized by different processes such as reactive extrusion, enzyme mediated, steam explosion and acid hydrolysis. The later process can be done using mineral acids such as H2SO4, HCl and HBr as well as ionic liquids. The role of these reagents is to destroy the amorphous regions remaining the crystalline domains. The degree of polymerization is typically less than 400. The MCC particles with size lower than 5 µm must not be more than 10%. The MCC is a valuable additive in pharmaceutical, food, cosmetic and other industries. Different properties of MCC are measured to qualify its suitability to such utilization, namely particle size, density, compressibility index, angle of repose, powder porosity, hydration swelling capacity, moisture sorption capacity, moisture content, crystallinity index, crystallite size and mechanical properties such as hardness and tensile strength. Thermogravimetric analysis (TGA) and differential thermal analysis (DTA) or differential scanning calorimetry (DSC) are also important to predict the thermal behavior of the MCC upon heat stresses. Please provide the the information about your business needs to help us serve you better. © Dip Chem Industries 2019 | Designed and Powered by Route Hosting.